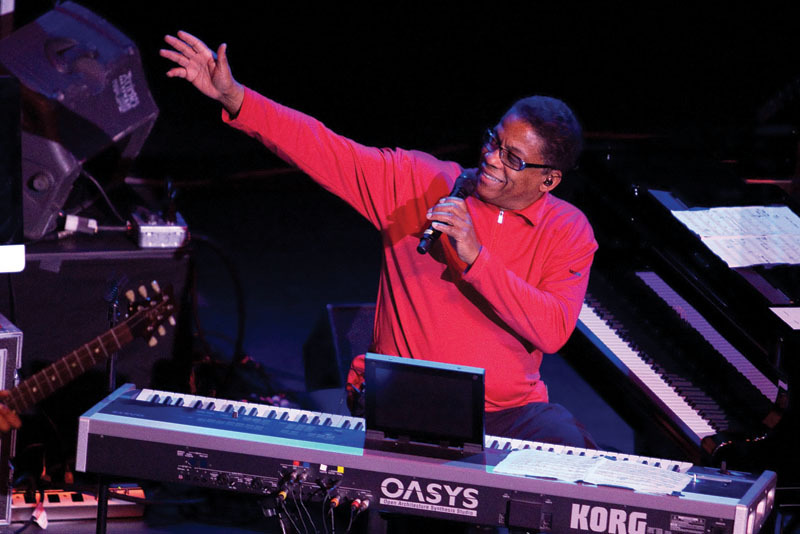 His name may have been the only one on the ticket, but Herbie Hancock was not afraid to share the stage with his latest collection of bandmates. That was the case Wednesday night when his tour made a stop at Beaver Creek’s Vilar Performing Arts Center. Hancock was supporting his latest album, “The Imagine Project,” which he describes as an effort to bring peace through global collaboration. It features musical artists from 11 countries and has vocals in seven unique languages. For obvious reasons, his long list of collaborators couldn’t be present for the tour so he assembled a quintet of some of the most talented and sought-after session musicians in the industry. The rhythm section was the most fun to watch. Drummer Vinny Colaiuta was a monster on his kit at the back right of the stage. Many people wouldn’t recognize his name, but he is often referred to as the most important drummer of our time. His razor-sharp timing and knack for nailing complex polyrhythms were on full display. The tour’s recent addition on bass, Welsh-born Pino Palladino, was especially noteworthy for his grooves during the jazz fusion numbers. Palladino, primarily known for his work in rock and blues music, has tremendous versatility and is a perfect fit for “The Imagine Project’s” multi-genre unification style. The most interesting playing came from guitarist Lionel Loueke. This man from the West African country of Benin is a unique talent and displayed his avant-garde style throughout the night. He went from standard strumming, to playing both hands high up on the neck of the guitar, and was creating a vast array of wild sounds without the aid of a multitude of effects pedals as any listener would suspect. Rounding out the band was Greg Phillinganes on backing keys and synthesizers. He added a good amount of depth to the band’s sound, but at times his choice of sound on the synth was a bit cheesy. He really shined the handful of times he took to the vocals. At one point during their rendition of Sam Cooke’s “A Change is Gonna Come,” he abandoned the microphone and sang unplugged at the front of the stage for a few bars, but his great pipes just couldn’t quite fill out the airy Vilar and he returned to his post never missing a beat. Vocalist Kristina Train joined the band on about half the songs as well. She came on a bit strong in her first, a cover of John Lennon’s “Imagine,” but came around to a better fit with the band as the show progressed. Hancock, casually dressed in a crimson sweater and donning black sneakers with white laces, appeared to really enjoy himself. At the age of 70, he could still pass for a man 20 years younger in both looks and spirit. (He bounded off the stage at the close of the show). He shared a lot of banter and jokes with the attentive but highly reserved crowd. He demonstrated his pianism mostly from his Fazoli grand piano and Korg synthesizer, but during “Watermellon Man” strutted the front of the stage with a white Roland AX-7 keytar and traded licks with Loueke and Palladino. The band gave a good retrospective of the legendary Hancock’s career. Songs like “Cantaloupe Island,” “Maiden Voyage,” and a few Headhunters era songs were present (including an exceptionally funky “Chameleon” encore that brought the mostly dispassionate crowd to its feet). But the standout song of the night was from the new album. “Space Captain,” a gritty gospel rocker, was exceptionally tight, emotional, and extremely well sung by Train. Its repeated line, “Learning to live together… ’til we die,” succinctly sums up Herbie Hancock’s vision of cross-cultural togetherness. Bob Bloczynski is an Eagle-Vail resident. E-mail comments about this review to cschnell@vaildaily.com.